Speaking as a member of the St. Louis Cardinals front office, Jim Riggleman spoke of minor league shortstop Greg Carmona to The St. Louis Post-Dispatch in August 1988. Carmona intrigued Riggleman, The Post-Dispatch wrote. "He has good range, a real good arm," Riggleman told The Post-Dispatch. "He's very raw. He really has to learn how to play the game." Carmona played that year between single-A Savannah and rookie Johnson City. He made AA Arkansas in 1990 and AAA Louisville in 1991. Whatever he learned, it wasn't enough for him to make the majors. Carmona's career began in 1987, signed by the Cardinals as a free agent out of his native Dominican Republic. Carmona started with the Cardinals at Johnson City. He hit .175 over 47 games. He stole 14 bases. He moved to Savannah and returned to Johnson City for 1988. He hit .226 between them in 54 games. He doubled in a June game at Johnson City. Carmona played 1989 at single-A St. Petersburg. He stole 31 bases, but hit .224. 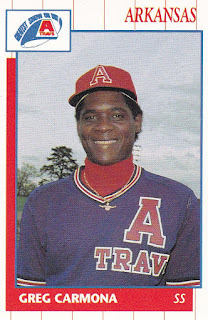 Carmona then made AA Arkansas for 1990. In 114 games that year, he hit .232. He picked up an infield hit in a June game. He made Louisville for 1991. He hit .175 in 56 games. He played another 70 games for Louisville in 1992, turning in a .147 average that year. He moved to the Brewers system for 1993 and played in 20 final games to end his career.